Defying Expectations – by Kate W.
As on every trip, people have expectations. But before this trip, we are always warned that we cannot be confined by our expectations. We need to be flexible and not surprised if something on the schedule disappears. It’s an adventure, and it’s all worth it. It’s only been a day, and our trip is already crazy. An amazing, exciting, crazy journey. Most people know that airports are always ready for emergencies. But what most people don’t know is that once every 3 years, the airport has a live practice for emergencies, which looks VERY realistic, and consists of at least 10 ambulances, news trucks, many buses, and people on stretchers. I think you understand that RDU chose for their one live practice drill to be TODAY. So we drove into the airport to be greeted by a full on plane crash scenario. Not the best way to start the day. Luckily, we eventually learned that it was just a drill. After the first exciting event of the day, we checked our bags, went through security, and got to our gate. Unfortunately, our plane was late and then had engine problems. It was delayed for over two hours. And our layover between our second flight was only an hour long. My dad and Mrs. Smith made a ton of calls and talked to a lot of people trying to, some way, find a way for us to make our flight. Even though it looked pretty gloomy, our group remained positive. After all, it was all in God’s hands. Eventually we boarded our plane and after they restarted the plane twice we got up in the air. We began to breathe a little bit because some people had said that once we got up in the air they could try to hold our plane for us. But we were ready to sprint (literally) through JFK to catch our flight. But luckily, towards the end of the flight, the flight attendant came up to us and told us that they had successfully contacted the tower and our plane was being held for us! We were still ready to sprint though. However, right after we landed, the lady also told us that the people at the airport had arranged for a bus to pick us up right outside of our gate and take us to our international flight. God was definitely on our side today. So we ran off our plane first on to the jet way and hopped into a giant bus that was waiting for us. Then we rode across and in between planes until we arrived at our gate. We hopped off of the bus and saw a huge plane in front of us. They opened the back door and set up a HUGE set of stairs for us. It was so loud I could barely hear as we took out our passports and tickets. I don’t know many people who can say they have had an experience like this. 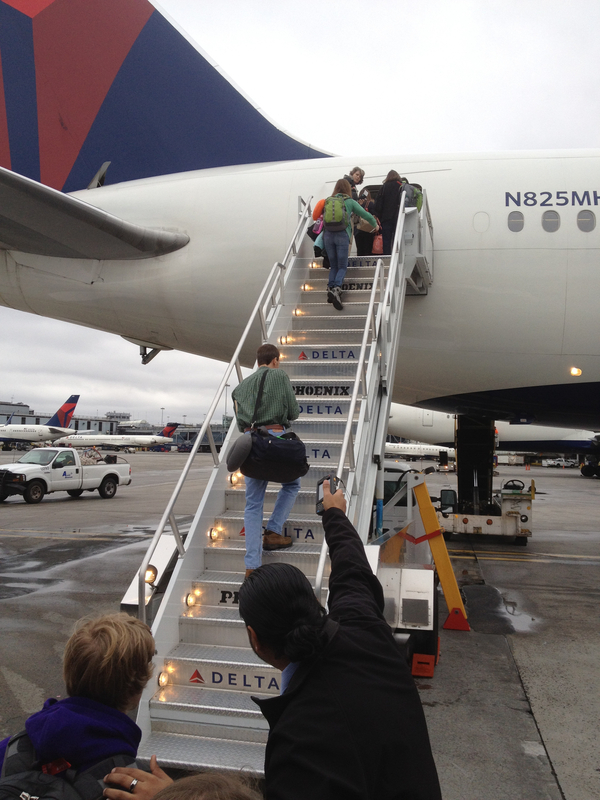 Mission 1:27 Team boarding a Delta 767 through the rear door off the tarmac at JFK. Special treatment from a special airline - thanks for holding our flight!! Today was an exciting day filled with experiences that are extremely rare. And I know that this journey will defy my expectations in every way possible. And that is just one of the things that is so amazing about it. PS to Kate’s Post – The team has landed safely at SVO in Moscow and we are waiting for our luggage. Everyone is happy, healthy and thrilled to be on Russian soil. There likely won’t be any more blog posts for 36 hours as we spend the day in Moscow and then have a 14 hour train ride to Kirov. But look to hear from us shortly. Thanks for everyone’s support.